Microsoft is best known for its Windows operating system and as being the arch rival of Apple (well, not these days, but way back when…). Anyway, they just happen to make great computer accessories too. You know, things like keyboards and mice. I happen to use both a Microsoft Natural Ergonomic Keyboard 4000 with my Mac, and also a Microsoft mouse. This review covers the keyboard and I’ll also explain why I use it instead of an Apple keyboard. Apple keyboards are beautiful, sleek and minimalist. They match the Mac, and work very well. But they’re not ergonomic. They’re far from it, unfortunately. So I had to look for an alternative. I’m not really a fan of repetitive strain injury or carpal tunnel syndrome, and that’s where the Microsoft Natural Ergonomic Keyboard 4000 comes in. 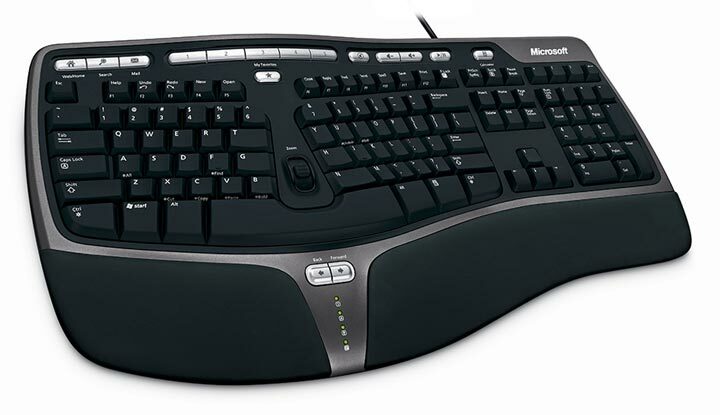 It offers an ergonomic layout with a split keyboard and a raised platform towards the middle. The built-in palmrest, coupled with the shape and curves of the keyboard, and a stand, forces your hands and most importantly wrists to lay on the keyboard in the correct manner. I can honestly say that from using this keyboard for just a couple of weeks, all the pain was gone. I type for hours each day, so I’m probably the best kind of person to review this keyboard. It did take me a little while to get used to touch typing on this keyboard, but it’s not difficult by any means. There are some other useful features. Apple tends to do away with as many keys as they can on a keyboard. Microsoft takes the opposite approach. This makes it somewhat bulky and large in comparison to an Apple keyboard, but you do get the added functionality and usefulness of a row of hot keys (Web/Home, Search, Mail), 1,2,3,4,5, Mute Sound, Volume Up/Down, Play/Pause Music, Calculator). I can honestly say – I do actually use these keys, especially for muting sound and pausing the volume. The 1-5 keys can be set to whatever you like. The Web/Home, Search, Mail keys functionality can also be changed through the software. 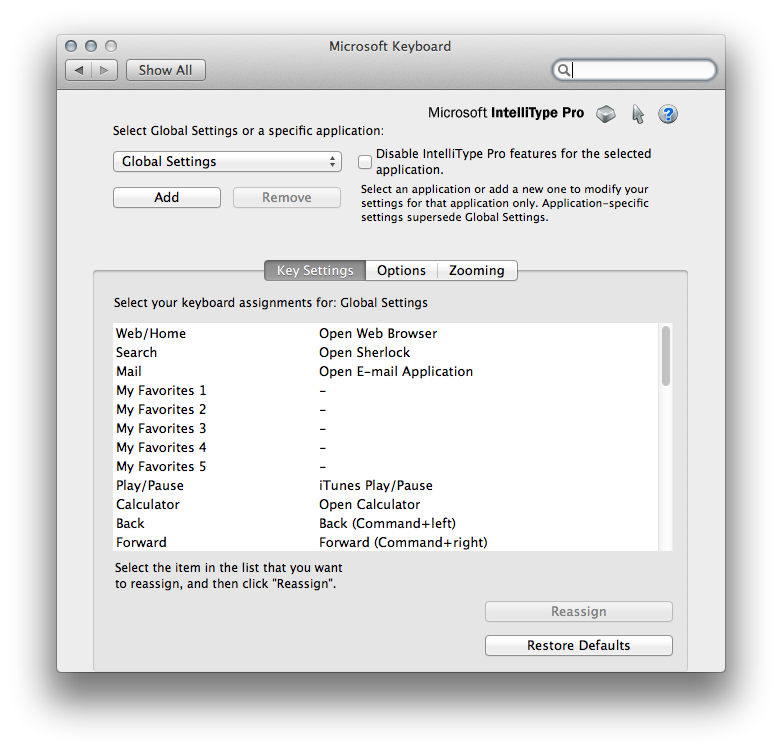 The Microsoft IntelliType Pro software is Mac OS X compatible and does the job its intended to. This software enables you to use and configure the extra features such as the Key Settings, and selecting which keys have which functions. The main thing I’ll re-iterate is that this keyboard is big, it is bulky (especially with the stand attached), and it doesn’t have the same build quality of Apple keyboards. It’s made of plastic rather than metal. The letters on the keys are the ordinary transfer type which wear off with use, and you’ll get very shiny keys if you use it frequently. But nothing has broken, and I’ve had it for a long time. If you’re a fan of the more traditional desktop-type keyboards rather than the thinner laptop-type keyboards, you’ll definitely enjoy using it. If you’re looking for a good value ergonomic keyboard that’s completely Mac compatible and easy to use, look no further. The Microsoft keyboard is definitely worth consideration. I haven’t regretted my purchase and I recommend it. Amazon sell this great keyboard for just $30.